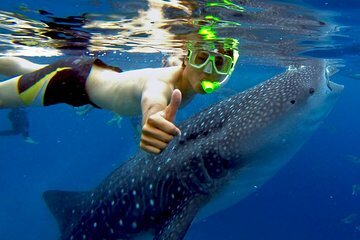 Get the chance to swim with whale sharks in Oslob on this full-day tour from Bohol. Enjoy the boat trip from Bohol, passing beautiful coastal scenery and coral atolls on the way. Learn how to swim respectfully with the sharks and about their biology and behavior from your guide. Round-trip ferry tickets are included, as well as hotel pickup and drop-off, which makes the early departure time stress-free.